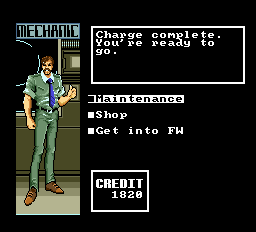 We present to you a translation patch for a mech dungeon crawler for the PC-Engine, Out Live. We began working on this project shortly after XSERD. We wanted to work on a shorter, more action-oriented game. Out Live is just that – what is more, it is quite original in some ways for 1989. For one, it is a mech dungeon crawler, which is a rather rare occurrence. 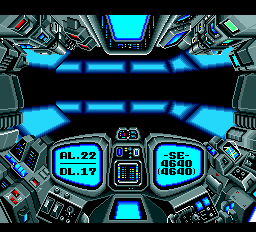 Also, it has nice enemy designs and soundtrack (the game was made by Sunsoft, so this shouldn’t come as a surprise). Overall, we hope you find this dungeon crawler enjoyable! A fun fact: this game was later entirely remade for PSX as Out Live: Be Eliminate Yesterday. 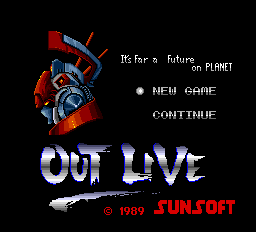 Out Live is a first-person mech dungeon crawler on the PC-Engine. Even if many Sunsoft’s PC Engine games weren’t generally all that stellar, they’d still be worth checking out thanks to their music. Sunsoft is known for rocking soundtracks, and this one is no exception. It is not a deep RPG, nor is it some sort of epic science fiction adventure. Similarly to NCS/Masaya’s Double Dungeons, Out Live is a simple, fast-paced dash through a series of look-alike mazes.Your goal is basically to become the champion of Duelists on planet Lafura, and solve the conspiracy involving your lost friend. You get from one town to the next via a tunnel network of sorts. As you might expect, towns are where you can repair your FW, buy equipment, and talk to people about to get a clue about what to do next. 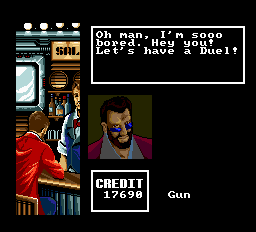 Duels are a huge part of the game – you cannot enter a new town if you hadn’t defeated all the Duelists in the town before it. As a result, the game is very linear. Since it’s a dungeon crawler, you’ll spend 90% of the time fighting enemies/dueling. It’s simple stuff, but it’s well implemented, as the scrolling is very smooth and the combat is fast. OL is a fun game that just might keep you focused for a while – just remember that there WILL be grinding involved, and better have a good number of healing items with you at all times. This game is notable for me because it’s very simple and very hard to hack at the same time. The simple part is that the game uses very neat pointered tables for 99% of its text without any text compression. So, it’s a breeze to dump the script. The game ROM expands without any problems, which is good (after X-SERD mirroring stuff shenanigans, at least). 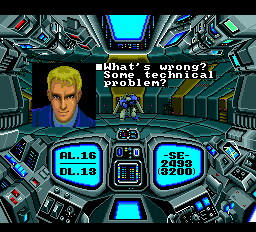 Also, it uses different text displaying mechanisms for dialogues text and items/battle quotes, which make it easy to hack them to use different memory segments. So, it basically jumps from text reading parts to the switch memory segment, reads the text, switches it back and jumps back. Easy enough, right? The very first issue is that the pointer table goes to that added memory segment as well, so every place that relates to these pointer blocks should be refered to. And then, once you do all that, you realize that there are quite a few such places. This requires to catch all ’em all and make the script dynamically change them. Also, many places point to the middle of the table, not the beginning. Those are even harder to catch. The second thing is that the game doesn’t have any multiple dialogue boxes. Every character line is placed in a single block, at all times. So, you’re either very limited to how many characters you can use, or you need to think of something else. The way we’ve decided to go with it was to change 8×16 to 8×8, thus allowing us to use double space for text. This hack wasn’t hard to make on its own, but required to make many additional hacks to fix all the places which ended up broken because of it. Also, it made password system unusable initially. Fixing it wasn’t easy either. The main reason was that the password uses katakana with dakuten/handakuten. So, the password had more characters than the input pannel has (64 vs 60). Not surprisingly, dakuten/handakuten was effectively killed while hacking. So, we had to analyze various methods in order to make the password system use fewer letters. This proved to be harder than we thought, so we tried to do it other way – to create the fourth line for the input panel, which wasn’t easy either, but worked in the end. Graphics are compressed, but the compression mechanism is not that hard to figure out (it’s a simple RLE-like algorithm). This translation is a non-commercial and unofficial project which is in no way affiliated with the game creators or distributors. We don’t own anything here and have no copyrights. We release this translation in the form of an IPS patch, not the actual ROM. Please, don’t ask us to send you the ROM, or where you can find it – we can’t help you with that. You can redistribute this translation freely as long as you don’t ask money for it and include this readme.txt file with it. We don’t condone any form of commercial redistribution. Please, keep that in mind. Copyright © 2019 Nebulous Translations.All rights reserved.